Here's a real 'facepalm' story for you. The 'UFO' filmed from the ISS looks a lot like the air bubbles are used to seeing. But most worrying is this big text box at the end of the story. If you dare question authority, government, NASA, or Scientism, you are a narcissist. Anyone reading this and not realising they are being brain washed, has serious problems. Great comment by Tim on that article..
“The further society drifts from the truth, the more it hates those who speak it”. The interesting thing about this controversy is to take note of which side all the hate, derision, mockery, and all-round general nastiness comes from. This will tell you a great deal about who has strayed far from the truth. That comment sums up the NASA fanboys, Joe Rogan, and all the idiots on YT who abuse, threaten, mock and generally attack Eric Dubay for his his excellent research and publications. Has anyone ever talked about why these actors all seem to place one hand on the wrist of the other arm? Are they doing that to hide something on the torso or are those strings attached to their arms as well? Their bodies look very rigid and not relaxed. blackchoy wrote: Has anyone ever talked about why these actors all seem to place one hand on the wrist of the other arm? Are they doing that to hide something on the torso or are those strings attached to their arms as well? Their bodies look very rigid and not relaxed. I guess that it's some sort of masonic hand symbol, I've seen it done many of time during the fake "ISS Hand over" ceremonies. So, I've been researching Earth for awhile now, slowly waking up. I'm to the point where I'm trying to talk to people about it and have a discussion only to be met with ridicule/abuse from some of my closest friends. What seemed odd to me about this was how ISS has a larger orbit travelling at less speed and somehow manages to complete it's orbit faster than Skylab. When I've got some more free time I'll look at supposed orbits more in-depth (all my data came from google/wiki, I'd like the data from NASA if possible) and see if there are any other glaring errors. EDIT: The simple answer would be elliptical orbits, I assumed spherical. Like I said more data is needed but I think this worth a more in-depth look. ISS has a larger orbit travelling at less speed than Skylab. You're trapped in Science Fiction data points. Do you like Space Tales? My point was looking for problems within the data that is provided. If figures provided by one source show inconsistencies then it goes a long way to discrediting that source. More-so than (possibly) an odd camera or lensing effect. likewise not quoted in any mainstream outlet. I'm just trying to think critically about it. I gave you SEVEN (7) Satellite Hoaxes and you thought it wise to tell me you couldn't find TWO (2) of them? Fair play, I wasn't trying to be anti but I searched your exact quotes. I should have looked harder perhaps. I'm still going to look into orbital discrepancies in NASA/ESA data: I think its worth a few days of my time especially if I turn up some more obvious errors, hard data like this could go a long way towards forcing some sceptics to reconsider their view. 0:29 Two big liquid blobs fly off the screen to the right as that frame opens. 0:39 A drop of water fall off her arm, too. 0:42 An air bubble in the "water" pouch floats down fast. I have looked into a lot of videos supposedly showing the ISS going by. Is it just me, or is it going just as slow as an airplane going by? Looks to be a projection since its fully lit up, from the ground.....we should see it shine, but not be able to make out details of the bottom. So I looked into how this could be achieved and wouldn't you know, they have an airplane that looks like a projection system imo. Now they claim this is an infrared telescope, so why is it out the side of the plane? A lot of people are hooked on this being the actual Hubble telescope.....like they believe they need to actually take pictures to make up the crap they give us. Starting to think they are trying to cover the fact this is not a telescope at all. Stating it sees in only infrared means you can't get real time photos....All from data right? They actually claim this thing sees further than Hubble. No concrete proof it is a projector, but at this point I can almost guarantee it is not a telescope. Why would a flying airplane be a good telescope? How do they claim they are targeting and keeping the same target while it moves? Anything with NASA on it, is now suspect to me. I think you make many good points here. I often wondered how a moving plane would make a good telescope. Likewise, as you said, why do they need a telescope at all to create images. At the same time, however, are you suggesting that this plane would remain airborne anytime the ISS should be visible at night? I assume it wouldn't need be up 24/7, since there must be times when the ISS would supposedly be out of view due to daylight. RickFE wrote: I have looked into a lot of videos supposedly showing the ISS going by. Is it just me, or is it going just as slow as an airplane going by? Looks to be a projection since its fully lit up, from the ground.....we should see it shine, but not be able to make out details of the bottom. So I looked into how this could be achieved and wouldn't you know, they have an airplane that looks like a projection system imo. If this video is honest, SOFIA is an aircraft that has multiple sensors equipped (HUBBLE, Infra Red, telescopic cameras, etc.). They do take plenty of images of the ground while flying to generate terrain maps using "real data", which is usually 3D effects applied over actual images or composites of the terrain (these effects include green plant growth, clouds, city lighting, etc.). Often they use actual "historical data" from many sources (weather data, etc.) to give a "near accurate" image of what would have been filmed at the time, were an actual camera to have been used. Google Earth uses the same tech that NASA uses under the hood, I have posted a bit about it. Why would a flying airplane be a good telescope? Telescopes work best for stargazing when there is no weather or ground based lights (pollution) to obscure the optics. This is why most telescopes are built on high mountains, beyond civilization. If your NASA with a 50 million dollar per day budget, you can afford to fly the worlds' biggest telescope to look at the shimmering lights in the night sky. ISS astronaut captures kaleidoscopic image of Himalayan lake,fake. And to me they always look as though they are hanging upside down and the camera is filming them as though they are the right way up, if you see what I mean. So the crossed arms and weird body hugging gestures (to stop their arms dangling oddly while upside down) unrelaxed demeanour and oddly bloated faces make more sense. Just a little theory of mine, I've got no evidence for it, just kept looking that way to me. Tsiolkovsky, the founding father of Astronautics wrote that Spacemen (Freemasons) within the man-made construct of Space should float inside the Spacecraft or outside it's airlock. 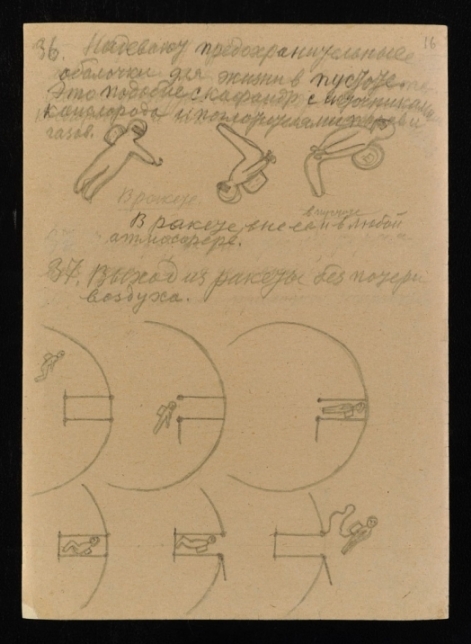 Konstantin Tsiolkovsky (USSR), inspired by the Science Fiction writings of Jules Verne, published "The Exploration of Cosmic Space by Means of Rocket Devices", showing that the man-made construct called Space was a physical place that could be explored. Drawing by Tsiolkovksy for the film ‘Cosmic Voyage’ showing a cosmonaut exiting a rocket via an airlock into the vacuum of Space. Just found this clip of my fellow Dutchman Andre Kuipers, who supposedly is an astronaut. I was looking to see if I could detect any fakery and after 10:00 I did; you can clearly see his harness trough his shirt when he comes close to the camera (to move a globe model out of sight, the irony). In the Netherlands obviously a lot a people look up to this guy (so did I), but I’m truly hoping one day this guy will be exposed as the liar he is! 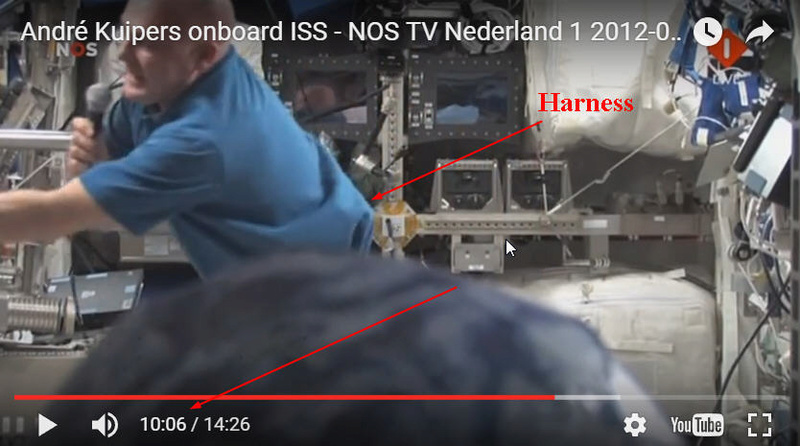 Just Vital wrote: Just found this clip of my fellow Dutchman Andre Kuipers, who supposedly is an astronaut. I was looking to see if I could detect any fakery and after 10:00 I did; you can clearly see his harness trough his shirt when he comes close to the camera (to move a globe model out of sight, the irony).